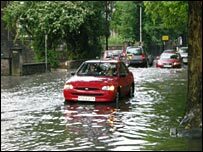 Torrential rain has caused severe flooding in parts of England, leaving people trapped in cars and homes. West Midlands Ambulance Service said crews had reported floodwaters rising to the height of car doors in the Herefordshire and Worcestershire areas. 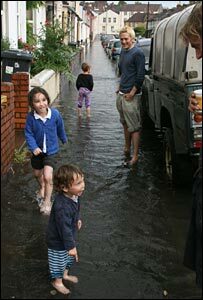 Two inches of torrential rain also fell in Kent, with parts of Folkestone, New Romney and Dover the worst affected. Some flights at Bristol International were cancelled or diverted when the airport lost power on Tuesday evening. Hundreds of homes and businesses across the greater Bristol area also lost power and many roads, railway lines and properties were flooded. Emergency crews in the West Midlands were inundated with calls after the rain swept in at about 2100 BST, affecting an area from north Gloucestershire to south Shropshire. A spokesman said it was a "local emergency" and priority was being given to the most vulnerable people affected. Hereford and Worcester Fire and Rescue Service received more than 300 flood-related calls in just a few hours. Firefighters in Shropshire responded to 136 incidents, in one of their busiest nights for years. A spokesman called it an "extraordinary night". Two Shropshire communities have been cut off - on either side of the River Severn at Hampton Loade - to the south of Bridgnorth. A road has been completely washed away on the Highley side of the river, isolating up to 50 people. Ambulance crews reported seeing water levels up to the height of car doors in Ross-on-Wye. 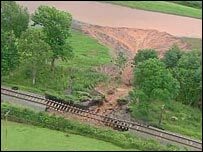 Severe flooding also led to the closure of large sections of an historic steam railway, after landslides blocked parts of the track. Two-thirds of the Severn Valley Railway in Shropshire and Worcestershire were closed when two weeks' worth of rain fell in 45 minutes. In some sections embankments were washed away completely, leaving the rails suspended in mid-air. The Severn Valley Railway runs regular passenger trains pulled by steam locomotives between Kidderminster in Worcestershire and Bridgnorth in Shropshire. Elsewhere, residents in parts of east Kent were spending the day mopping up after a night of storms brought flooding and power cuts to thousands of homes. Kent Fire and Rescue said it took more than 400 emergency calls in a three-hour period on Tuesday night. 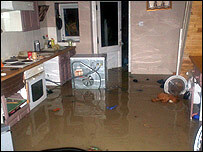 Malcolm Dyer, from New Romney, said he watched helplessly as four inches (10cm) of water washed across his living room. "It came in like a stream," he said. "There was nothing we could do." Another resident Paul Turvey, who lives in East Street, Dover, said his street "became like a lake" shortly after 2000 BST on Tuesday. He sent pictures of a neighbour's basement kitchen in which a fridge was "floating across the room". EDF Energy said the storms had damaged overhead cables, leaving some 2,000 customers still without power. The areas that remain affected include Worth, Shepherdswell, Deal, Richborough, Hawkinge, Sarre and Wingham. The company said it was "working hard to restore power as quickly and as safely as possible." Are you in an area affected by the flooding?